Sawyer Haas is weeks away from finishing law school, but exhaustion, dwindling finances, and the pressure to provide for himself and his daughter, Olivia, are wearing him down. A federal clerkship–a job he desperately needs–awaits him after graduation, but only if he passes the Bar Exam. Sawyer doesn’t have the time or patience for the capricious—if beautiful—dancer who moves into the apartment above his. But Darlene’s easy laugh and cheerful spirit seep into the cracks of his hardened heart, and slowly break down the walls he’s resurrected to keep from being betrayed ever again. When the parents of Olivia’s absentee mother come to fight for custody, Sawyer could lose everything. To have any chance at happiness, he must trust Darlene, the woman who has somehow found her way past his brittle barbs, and Darlene must decide how much of her own bruised heart she is willing to give to Sawyer and Olivia, especially when the ghosts of her troubled past refuse to stay buried. Emma Scott is always a hit or miss with me. I don’t think that’s a bad thing, some of her books just hit me a lot harder than her others do. I usually really like her books or I just don’t care for them too much. 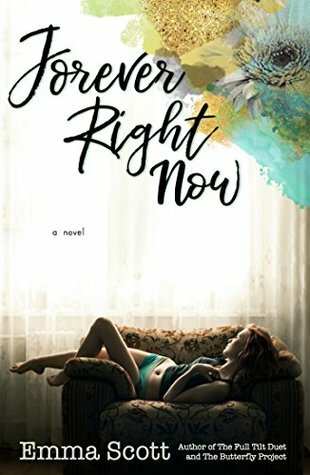 Forever Right Now is one that I really enjoyed, way more than I initially thought I would. The story line was refreshing. I think it was my most favorite part. The person that Darlene was mixed with the person that Sawyer was was just too good *insert heart eyes emoji*. It also made me realize how much I am such a sucker for the single parent story line. Whether it’s a single mother or father, I think I’m a fan. But what I enjoyed the most was Emma’s ability to create a feel good slow burn. And I think that is why I really liked this plot. It wasn’t built on the sexual relationships that most books these day build themselves around. It was definitely way more than that. And the pacing was magnificent and completely worth the wait we experience as we read. The character growth was steady and included both main characters which is always a plus for me. When one character gets left behind, it makes me itchy. So, to know that both Darlene and Sawyer are two people who are drastically different get where they need to be, eventually…makes me happy. It’s good to know that any time I pick up an Emma Scott book I will experience all types of things and Forever Right Now makes you feel a lot. A lot more than I anticipated. For someone who is hit or miss for me, she sure did hit me right in the feelers with this one.